I will not suggest that because he’s most widely known as a game show host, Pat Sajak should refrain from opining on matters political or societal. A democratic culture demands and thrives on the free expression of diverse opinions, and the quality of our democracy is enhanced whenever anyone, from any walk of life, develops enough interest to express a viewpoint. Nor will I suggest that by adding Sajak as a contributor, the online version of National Review has somehow cheapened the brand of intellectual conservatism pioneered by its legendary founder, the late William F. Buckley. Sajak’s no intellectual, but intellectuals own no exclusive claim to meaningful discourse. 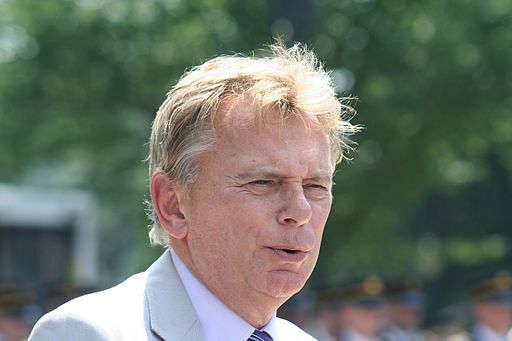 No, my issue with Sajak’s recent stab at political philosophizing (see his inaugural National Review post, here) is one of substance rather than propriety: Apparently, like most of the radical right these days, Pat Sajak is less than keen on the virtues of a robust democracy. So…wait…what? Public employees should be allowed to vote, unless the vote really, really matters to them? Sajak may not be a scholar, but neither is he a dummy–he knows the difference between fiduciary obligations and voting rights, and he knows, therefore, that his whimsical little riff on conflicts of interest in general elections is both disingenuous and pernicious. Suffrage–the right to vote–wasn’t always a “gimme” for all Americans. Initially afforded exclusively to white, land-owning males, voting became a right available to everyone only after hard-fought battles in hard-won stages, a democratizing process that most fair-minded thinkers would describe as progress. Sadly, though, in a pattern that’s too consistent to be random, many of today’s conservative extremists advocate returning to a time when the benefits of our society were less inclusive, and our culture less democratic. Whether it’s Sharron Angle in Nevada advocating an end to Social Security, or Joe Miller in Alaska advocating an end to the minimum wage, or David Harmer in California advocating an end to public schools, the new, extremist conservative movement wants not merely to stem, but to reverse, the policies and institutions that have slowly but steadily nudged our country toward a more inclusive, more democratic way of life. By coyly musing over whether some citizens should have their hard-fought, hard-won voting rights restricted, Pat Sajak seems to share that backward longing.